I’ve been mulling something over in my mind the last few days. Am I a hypocrite? I am a big supporter/lover of Web 2.0. Part of me loves the fact that the average Joe can contribute to the content of the web. You no longer have to have a degree in computer science or have spent years learning code to be able to add your mark to the world wide web. I love to see people contribute to the web via word, photo, video or code. I’ve hopefully influenced many people where I work (both internally and externally) to become a part of their web – to participate or contribute in some small way. So why the feeling of being hypocritical? 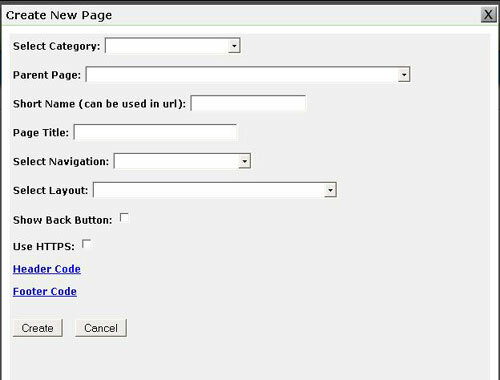 Two reasons – wikis and sites that allow people to create websites without teaching them to properly code or design. Since both wikis and sites that help the average Joe create their piece of the web are definitely Web 2.0 you can see my dilemma. Although I can appreciate that both technologies give the ordinary non-geek type a way to express themselves I feel they do a bit of harm in the long run. They don’t teach people the backbone behind the pretty pages they see on the web (proper coding). They also don’t teach people that loading a site full of information without giving proper navigation and thought to function (usability) is a disservice. The worst part is they don’t teach people to be web standards compliant. 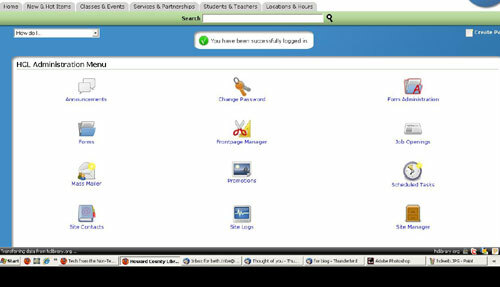 They allow people to add information, color, pictures, videos, links, widgets, etc. but fail to teach them basic rules that if followed will make their wiki or site be accessible by anyone on any operating system in any browser. Perhaps the next Web 2.0 application can somehow allow people to contribute to the web but teach them proper design and coding in the process. If so, that will be a technology I can get behind. I’m afraid as much as I love Web 2.0 I can’t support wikis or sites that allow you to create a web page or whole site without teaching you what works and doesn’t on the web these days. So call me a hypocrite. Title is a nod to Crack the Sky‘s “Skin Deep”. Ah, beauty is a thing to behold. Beauty, they say, is only skin deep. Well “they” are wrong. In this case the real beauty is more than skin deep. 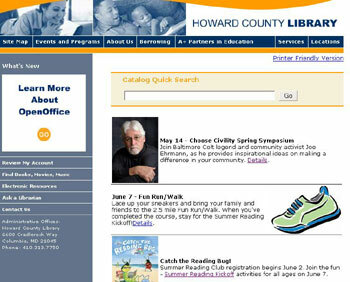 On May 28th at 5:30 am, Howard County Library launched their brand spanking new web site. A much cleaner style, easier navigation than our previous site, quick easy pop-up contact forms as well as integration of Amazon and Google maps makes this something to behold. But what most people don’t get to see is it’s inner beauty. Danny Bouman our web programmer/architect/code monkey extraordinaire wrote the whole backend that we use to actually add the content to the web site. Deep down this baby really rocks. He wrote the admin side to make it easier for our Marketing/Public Relations and Human Resources departments to add information. These folks are wizards at their jobs but most of them have no html, css, or php experience. 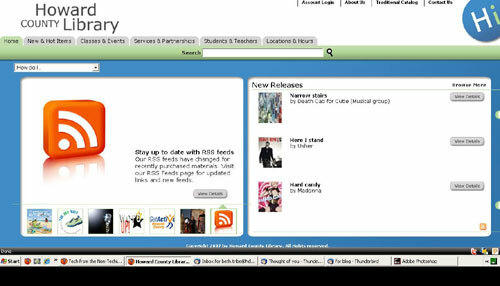 Now they can add pages, put up front page blurbs (that highlight our classes & events), and add job openings with ease. As someone who brought over content from the old site to this one I can attest to how easy and beautiful the backend is. I am extremely proud of what our web programmer has done. Many can’t see the real beauty but that doesn’t take away from the skin deep beauty of the site. WordPress has a quote “Code is poetry” so I’ll borrow that and add “Code is beautiful poetry”. Note: And for those who want to know, yes – it is open source. We hope to have it out and available to the open source community sometime soon. If you can’t wait and want the source contact me and I’ll put you in touch with Danny. Web Come a Long Way, Baby! I guess helping out a bit with our new web site and watching John Sanders’ Web Trends report on WBAL TV this morning put me in a nostalgic mood. He talked about The Wayback Machine where you can access web 85 billion pages from the past. They archive web pages from 1996 to 2007. 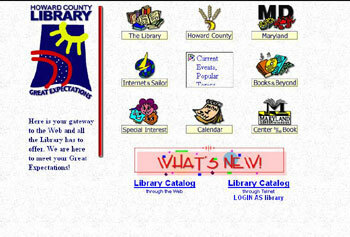 So I decided to take walk down memory lane with our library’s web site. First archived page I came upon was Dec 17, 2001. I had almost forgotten what it had looked like and how ugly it was. *shudder* Knowing what I know now about html, php, css and more this just makes me twitch to look at it. Mind you I am no expert in any those but even a novice such as myself can see what we did wrong (by today’s standards) with this site. 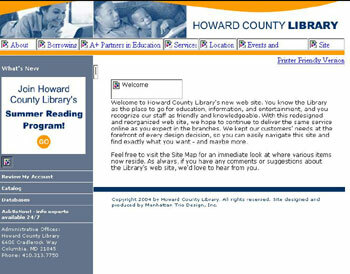 Then I skipped ahead to 2004 when we first rolled out our current web site. A bit of progress but still by today’s standards it lacks. Of course this was before Web 2.0 among other things (e.g. viewing web sites on mobile devices). But I predict the future will be cleaner, prettier and easier to navigate. We will solicit input from our customers, we will include such Web 2.0 features as podcasting, blogs, and eventually tagging and customer comments allowed in our up and coming catalog (which will seamlessly blend with out new web site). Keep in mind we aren’t live yet and a screen shot doesn’t do a live web site justice….but this is leaps and bounds ahead of our past. But as in all things in life we must learn from our past and apply it to our future. I know we will continue to grow and learn but I think our new web site (thanks to our talented web programmer) is fresh, new and clean. Can’t wait for it to be finished and to go live!